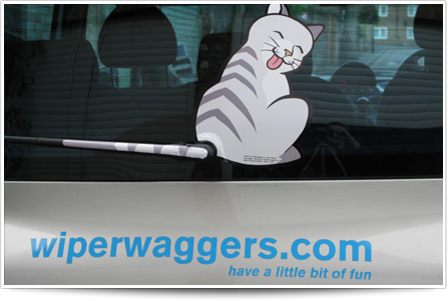 A WiperWagger®. is a completely legal addition to your car in the UK you can't be stopped for having one on the rear windscreen. New products coming soon include additional dog breeds and a waving wild thing or two. Get in touch if you want to suggest a new version. A breed that has become very popular. Did Game of Thrones play a part? Perhaps! Huskies are beautiful, clever, energetic and reliable friends. Keen on exercise - this is your companion for trips outdoors. Show your support for this wonderful breed. Anyone purchasing multiple units or from outside the UK should purchase via ebay by clicking here where you can also select the correct overseas postage & packaging rate. This breed is the best! A well-mannered, good natured and reliable friend. 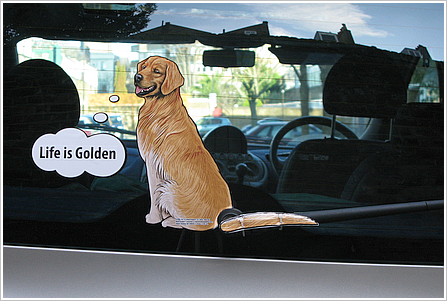 As a Golden Retriever fan you can show your support for this wonderful breed from the back of your vehicle. This breed is very intelligent and well mannered, a reliable friend and (shh!) an exceptional gun dog. As a Black Lab fan you can show your support for this beautiful breed. This ghost like Madagascan primate breed is a social little creature but threatened with extinction. 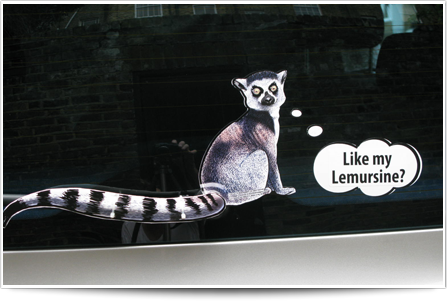 Celebrate your love of this wonderful primate and its wonderful distinctive ringed tail from the back of your "Lemursine"! Such a popular breed! Strong, intelligent, trainable and obedient. What a combination of talents! 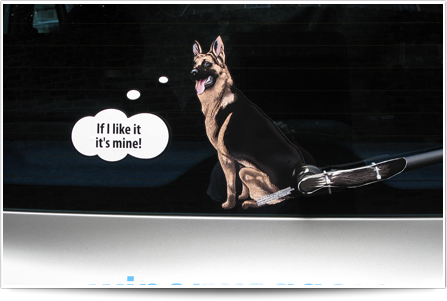 Show your support for this wonderful working dog from the back of your car. 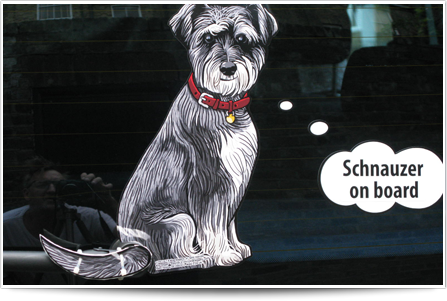 Schnauzer the dog breed renowned for its distinctively bearded snout and long feathery eyebrows. 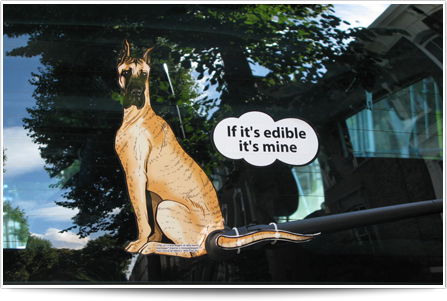 Protective and energetic and above average intelligence it's a wonderful breed to celebrate from the back of your vehicle with its cute waggy wiper tail. The Chinese Shar Pei renowned for its distinctive features of deep wrinkles and a blue black tongue and short rough coat. It's most wrinkled at the puppy stage and looks not dissimilar to a woolly towel. It grows into its skin gradually smoothing out most of the wrinkles. This is a rare breed, very independent and reserved and cute too! 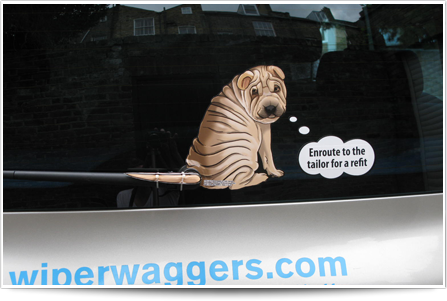 Show your love and support for the Shar Pei from the back of your car. There's always a member of the Meerkat mob on sentry duty keeping a look out for threats. 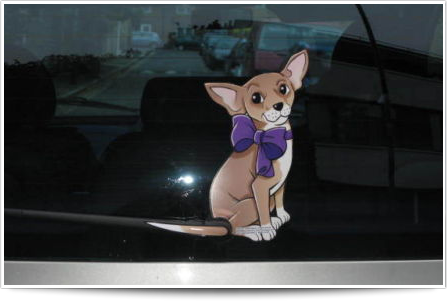 Benefit from the alertness of this little beastie keeping an eye on those behind you to ensure they are driving safely. This breed is a beast size-wise but a loving and wonderful breed. 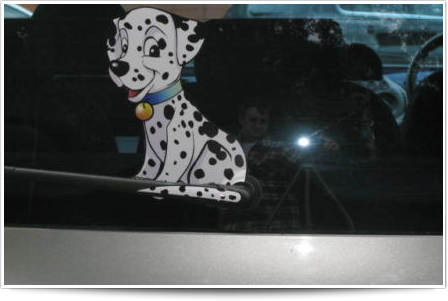 Celebrate your love of all things Great great great Dane from the back of your vehicle even if the dog can't actually fit in! Bring some cheer to those following behind. 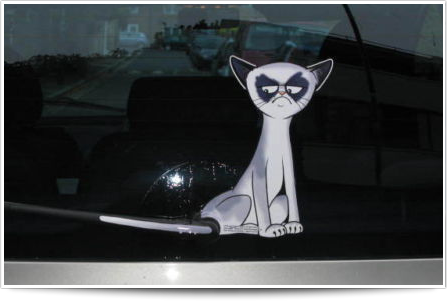 If you're a happy cat at heart and prone to smiling about things and want to spread that happiness all around when you are in the car then a Happy Smile Cat is for you. Tranquil and content it'll make congestion and gridlock easier to face up. 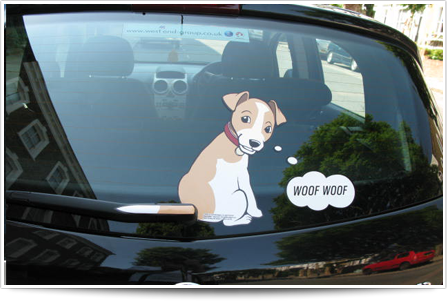 Get that Happy Smile Cat on the back of your car! . A great big bear of a breed and a great family pet with an appetite to match. 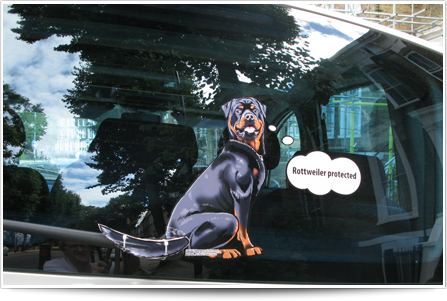 Celebrate your love of all things Rottweiler from the back of your vehicle. Show your support for this wonderful breed and keep those behind on their toes! 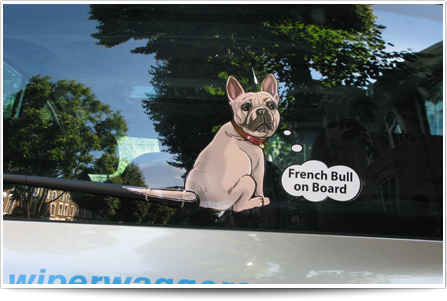 Celebrate the Bouledogue Francais that beautiful breed and close relation of the Great British Bulldog. A chic little number that reminds us of the entente cordiale with our wonderful neighbours across from Dover. This is the nicest, friendliest breed and one that all the family will love to have at home. A stylists dream and a fun loving friendly breed. 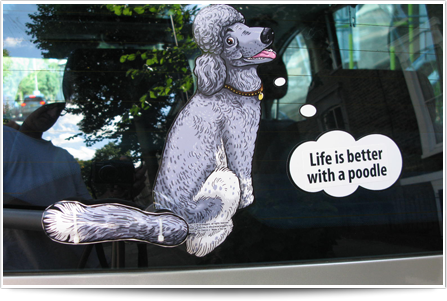 Celebrate your love of all things Po Pood Poodle from the back of your vehicle. Show your support for this wonderful breed and lighten the day for those following behind. 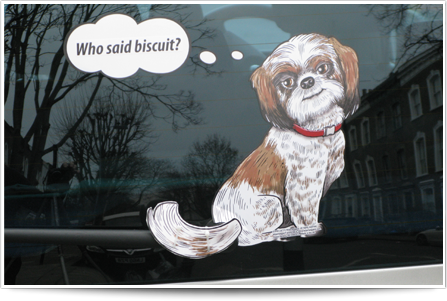 Celebrate your lovely Shi Shi Shi Shih Tzu, that wonderful fine breed, the pet who'll often wear a topknot because they are soooooo cute. This is the nicest, friendliest breed and one that all the family will love to have at home. 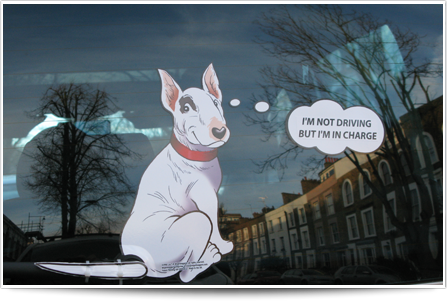 Celebrate your lovely gorgeous Bullie, the fine English Bull Terrier breed, the pet who is in charge of everything even if you are the driver! So distinctive with its egg-shaped head, the strong jaw, funny triangular eyes and its full body and muscular shoulders. It's a gladiator of the canine race and full of spirit but still a perfect family member. Celebrate your Puggy Pug Pug dog with its wrinkly, short-muzzled face and curled tail. It's got a fine, glossy fawn coat and a compact body with well-developed muscles. 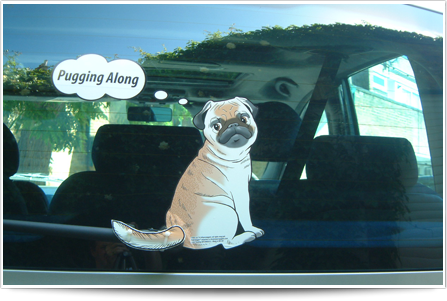 Get Pugging along in your motor and bring some cheer to your journeys. Show your love of that huge hairy monster that is an Irish Wolfhound, such an imposing sight due to its formidable size, the tallest of all dog breeds. If you have one of these ravenous things then you'll need a truck with a rear wiper to transport it around and a meat factory to feed it!!! 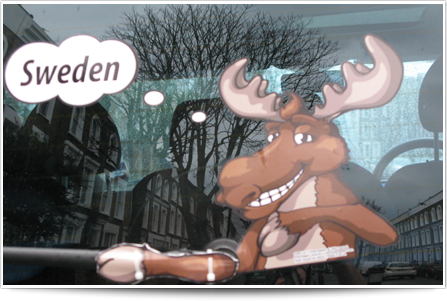 Show your support for the Mighty Moose / Elegant Elk of the cool forests of the North with Waving Hoof fitted to your car rear windscreen. Your Moose of that Elk will give the wave to those behind you. 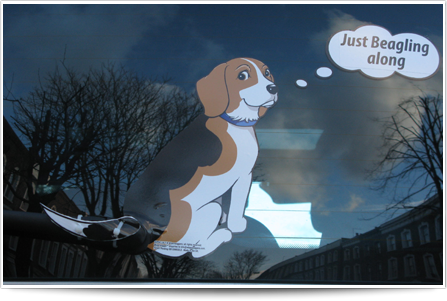 Celebrate that favourite Beagly Beagling Beagle with those around you with a Beagle Waggy Wiper Dog with Wagging Tail™ fitted to your car rear windscreen. 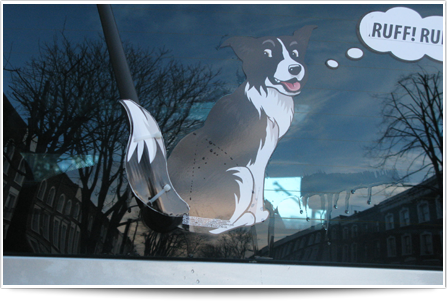 Celebrate your passion bordering on crazy for Border Collies with a Waggy Wiper Dog with Wagging Tail™ fitted to your car rear windscreen. 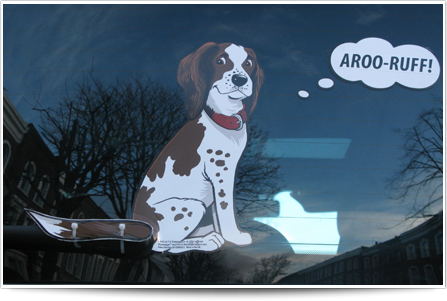 Celebrate that special spaniel with a cocky Cocker Waggy Wiper Dog with Wagging Tail™ fitted to your car rear windscreen. Get all cocker as you drive around and about. 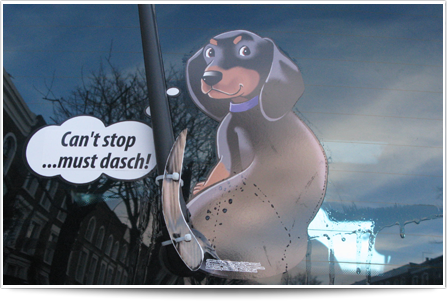 Celebrate your love of that elegant sausage on legs, the divine and vertically challenged Dachshund Waggy Wiper Dog with Wagging Tail™ fitted to your car rear windscreen. 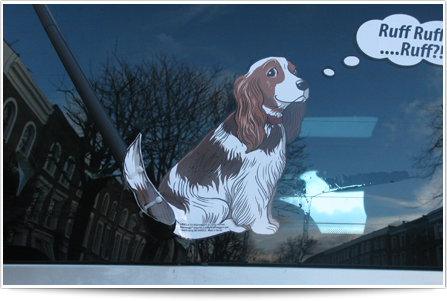 Celebrate your devotion to Springer Spaniels with a springy sprunger Waggy Wiper Dog with Wagging Tail™ fitted to your car rear windscreen. As a fan of this fantastic breed you can spring a waggy surprise on those around you. 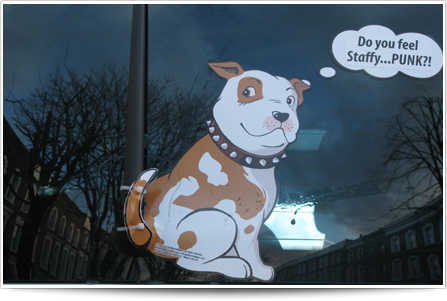 Celebrate your support for Staffies with a big beastie of Bull Terrier Waggy Wiper Dog with Wagging Tail™ fitted to your car rear windscreen. 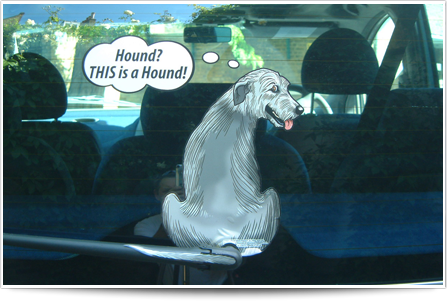 As a fan of this powerful breed you can show how funny and friendly they really are from the back of your car. 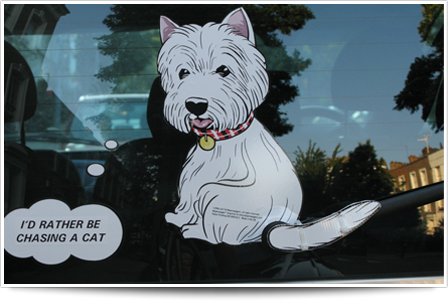 Indulge in a cat lovers extravaganza with a cool and crazy ginger Car Cat with Wagging Tail™ with a big bright bushy wagging tail or easyfit slimline version and four LOLCAT thought bubbles. 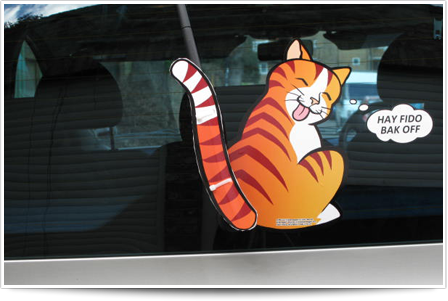 Your ginger Car Cat will bring you luck, happiness and buckets of pride as you drive around wagging that tail! 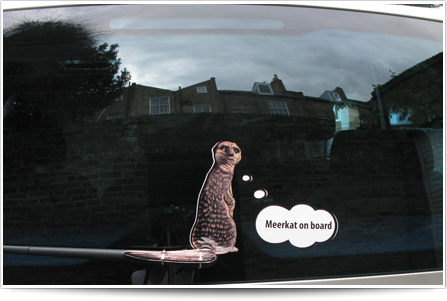 A smooth and sophisticated grey and black Car Cat with Wagging Tail™ with a luxurious bushy tail or easyfit slimline version and four LOLCAT thought bubbles. 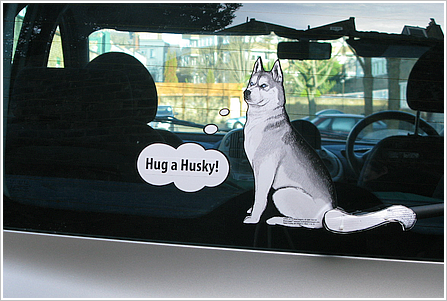 Your sleek grey Car Cat will bring you envious glances as you drive around. 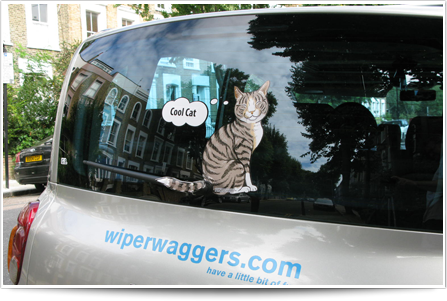 You wipe and the Car Cat wags that tail! Just the thing for all you massive Whippet lovers. A sleek and silky whippet image to celebrate your fondness for this wonderful breed and to have a bit of a laugh when you're going Down the Dogs (or anywhere else for that matter). This gorgeous animal just looks so racey. A feisty little Westie nicely groomed with a cheeky face and quick moving short tail. As a Westie lover you can show your support for this intelligent and self-assured little breed and its endless energy and determination. A bright and friendly Jack Russell with a fantastic Waggy Wiper™ tail which wags when there's fun to be had. 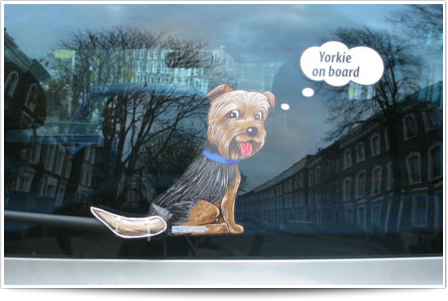 Comes with an easy-fit adjustable length tail and four pre-printed doggy thought bubbles. 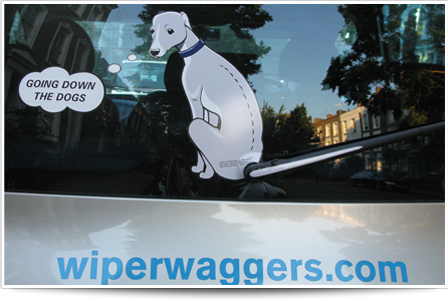 Your cheery Waggy Wiper dog will add a bit of fun to your car journeys and cause hilarity for fellow motorists. You wipe and the cheeky little Jack Russell wags his tail. 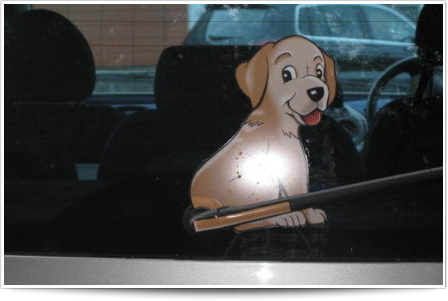 Celebrate your love of this well mannered, good natured and reliable friend with a gorgeous Retriever Lab Waggy Wiper Dog with Wagging Tail™ fitted to your car rear windscreen. 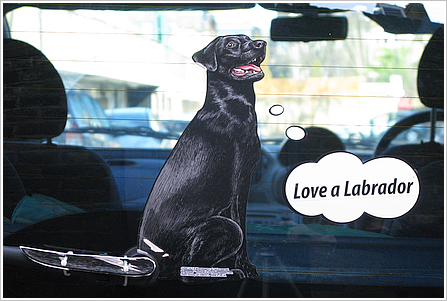 As a Retriever Lab fan you can show your support for this wonderful breed.